The B OK Animal Rescue is an all-volunteer organization dedicated to the quality care of homeless, sick, and/or abused animals. B OK is composed of volunteers that have many years of experience dealing with domestic animals. B OK is a non-profit, no-kill organization. All funds are spent providing needed shelter, food, medications, nurturing and quality care of the animals. The love is provided for free. Currently, B OK is located in a small 1500 sq foot structure on 3/4 of an acre. We are raising funds and looking for a property location with a larger structure or several structures on more acreage so that we can expand the number of animals we can care for. Ideally, this new facility will have enough pasture space so that larger grazing animlas such as Horses, Mules, Donkeys, Cows, Goats, and other large domestic animals can have room to excercise. The property will also ideally have a barn with individual stalls, or several barns with stalls to house these larger animals. 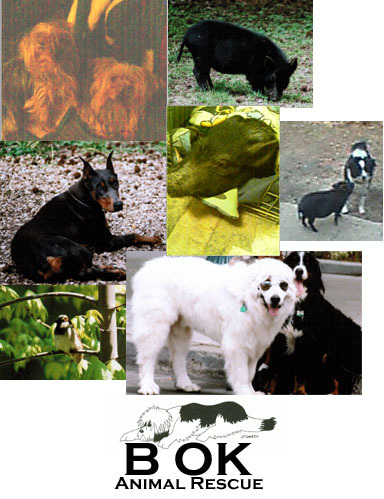 The dog and cat structure can be built with some of the funds being channeled for that purpose. We have the architects plans, and they are wonderful! The "dog house" includes a large community yard, 50 individual kennel runs, all of which have a covered portion on the outside, and have a doggie door to the inside portion of the kennel. The cat house will have a large community room with over 400 sq foot of "cat trees" for climbing, playing and just hanging out. There will also be two other attached community rooms for the cats, as well as individual areas for our more "picky" feline guests. Or, we can adapt an existing structure if it meets our needs. Blake Ovard (a great animal artist), who is one of our volunteers, has offered us space here on the web, and has offered us a portion from everything he sells here of of his website. (basically, everything over the wholesale price!) Please click here to go to his website. He has some great bookmarks, gift packs and greeting cards that everyone could use! Give a B OK one time Honor Gift and celebrate the special animals, people, and relationships in your life with�the gift that gives�animals a second chance. Remember the lives of people who celebrated the human-animal bond, or a companion animal who changed the lives of those he or she loved.